How Many Web Sites Exists As Of Today - July, 2012. 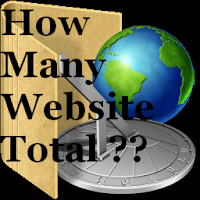 Total websites numbers are keeps growing everyday. Everyday 40,000 websites get registered that goes average 27 websites registration per minute. Out of these many web sites only 30%-35% are online and in running condition, remaining 65%-70% web sites are either under construction, not active, under maintenance, or just got registered. Apache (Linux based) Web server has highest market share 64% whereas Microsoft (Windows) IIS web server has only 13%. A web server is a server software on which all websites are hosted. Why Web Site Numbers Have Increased? 1. Internet Availability - The main reason behind huge growth in web site number increase is availability of internet in almost every corner of the world. 2. Personal Website and Blogging - Increased number of personal websites and blogs. 3. Cheap Hosting - One more main reason in increased web site number is cheap domain registration charges (10$ yearly) and web hosting fee (60$ yearly). Help Me Choose Name For My Website? Web Site Of The Day - Everyday A New website. Click here to us and stay in touch for latest articles and updates. Please see below graph to find how website numbers have grown over the years.